A lived-in look adds rich character to this large TV stand with an electric fireplace insert. Its simple style with framed glass doors and block legs is enhanced with a dry vintage weathered black finish with heavily distressed details. With practical storage and display space and a vintage casual appeal, this stylish TV stand will be a versatile addition to your living room. It accommodates TVs up to 65". The top of the unit has room to place a sound bar. Wire management openings and adjustable shelves allow space for electronic components. The fireplace insert has LED technology and a remote control with LED display. Its realistic wood burning flame effect combined with life-like logs creates an inviting atmosphere. It features two level temperature setting and a 20 watt high quality fan. The insert features a thermostat heating and overheating control device and a down light. Its flame operates with or without heat. The Gavelston Distressed Black Large TV Stand with Electric Fireplace Unit by Signature Design by Ashley at Standard Furniture in the Birmingham, Huntsville, Hoover, Decatur, Alabaster, Bessemer, AL area. Product availability may vary. Contact us for the most current availability on this product. Storage Top opening with divider 53.00" x 16.50" x 5.50". Door opening (2) 12.25" x 15.50" x 19.75". Adjustable shelf (2) 14.50" x 16.00" x 0.63". 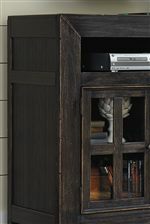 This entertainment collection offers fine rustic craftsmanship along with ample storage space for electronics. The look of the dry vintage weathered black finish creates an inviting vintage casual design style with an up-to-date appeal. The Gavelston collection is a great option if you are looking for Casual furniture in the Birmingham, Huntsville, Hoover, Decatur, Alabaster, Bessemer, AL area. Mitered Corner Detail. Glass Doors. Browse other items in the Gavelston collection from Standard Furniture in the Birmingham, Huntsville, Hoover, Decatur, Alabaster, Bessemer, AL area.